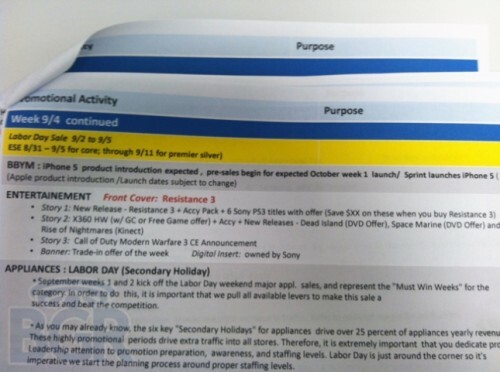 Thanks to a leaked document from a Best Buy source, we have discovered that Best Buy and Best Buy Mobile stores are anticipating taking preorders for the iPhone 5 starting in the first week of October. What’s a tad bit more interesting, however, is the mention (and further anticipation) that Sprint will be carrying the iPhone 5 at launch. This isn’t the first time that the iPhone 5 has been rumored to appear on Sprint at launch, and it’s still possible, although unlikely, that Best Buy are informing their stores based on the same circulating rumors. Further to the rumor of an October launch, ThisIsMyNext is reporting that Best Buy is expecting a new “Apple Fixture Installation” on October 21st, which is likely to be displays and merchandising for the iPhone 5. To be clear, this isn’t a run-of-the-mill installation for the big box — our tipster tells us that the request that a manager be on-hand at 6AM is out of the ordinary (they usually show up at 7AM for inventory), and that a similar arrangement was scheduled for the iPhone 4 launch.